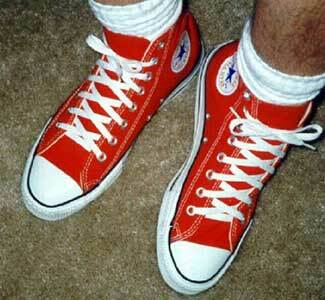 Chucks Are An Important Part of the Retro Rage. Chucks Defined as an American Legacy by the Smithsonian Museum. Chucks All the Rage in France and Belgium. Chucks Go to the Prom. Chucks Go To An Inauguration. Chuck Taylor at the Opera. Converse Sponsors a Horror Movie. How to Report an Unusual Chucks Sighting. Chucks are now appearing in department store advertisements on a regular basis. The main place you see them is in the department store supplements that are included with your newspaper. 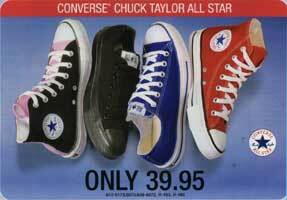 During the early part of this century, most department stores did not carry Chuck Taylors. But with the new demand for chucks and the retro look, big stores want to take advantage of the trend, something they have not recognized for past few years. As a result, many additional stores have added chucks to their shoe inventory on a national basis. Stores like Sears, Kohl’s, Macy’s and Sportmart have jumped on the bandwagon. Chucks are being shown in ads for kids, teens, and young adults. With chucks continuing to grow in popularity among kids and teenagers, you now see pictures of them in back to school advertisements and sales for clothing designed for this age group. Sometimes the chucks get cut off by advertising lines, but you can still see them in the pictures. Often they appear even when the store doesn’t feature chucks in their shoe sales. But that’s all right. You can order as many pairs of chucks that you need for back to school right through our website store. Another trend is that jeans manufacturers are starting to advertise their products showing how they look when worn with chucks. One reason is their popularity and another is that the distinctive look of the Chuck Taylor shoe photographs very well with denim products. The ChucksConnection has put together flash displays and photo galleries of these pictures, organized by category. Click on the links to see the galleries. Ads in photo gallery format. Click on the image to see the ads for new pairs of Chuck Taylor shoes. showing legs and pairs of chucks. Click on the images to see ads with pre-teens wearing chucks, usually advertising clothing. adult ads in a photo gallery. ads in a photo gallery. jeans ads in a photo gallery. Ads with pre-teens wearing chucks, usually advertising clothing. Ads with teenagers and adults wearing chucks, usually advertising clothing. Ads with little kids wearing chucks, usually advertising clothing or toys. 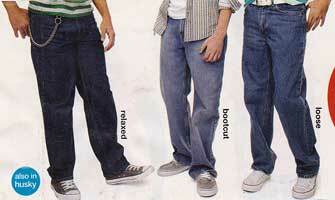 Ads for Levi’s and jeans, showing legs and Chuck Taylor shoes. Ads for new pair of Chuck Taylor shoes. Ads for shorts, showing legs and pairs of chucks. Flo has been a long standing character in Progressive Insurance advertisements. 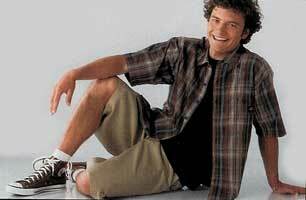 Just as we see more people wearing chucks these days, chucks have been appearing in more television commercials. 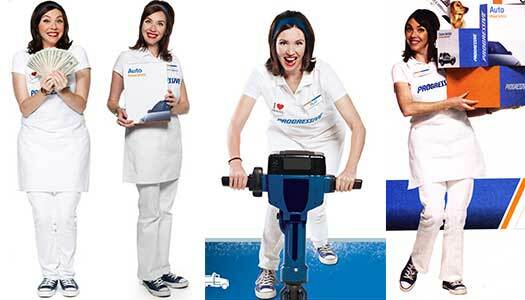 Probably the most prominent are the Progressive Insurance commercials featuring Flo, who is portrayed by actress and comedian Stephanie Courtney. Over 100 commercials featuring Flo over the past decade. She is always dressed in a white Progressive uniform, and wearing navy blue chucks. In the past couple of years, more characters have been added to the commercials, dressed in the same exact attire. The unisex capabilities and appeal of chucks is showcased in these advertisements. Here are some more past nationally aired commercials on television where chucks have appeared. A Pepsi commercial during the 2013 super bowl halftime show featuring Beyoncé shows a fan reaching for a Pepsi out of a vending machine that starts a countdown to her performance. In the video many fans are shown dancing all wearing different outfits; many of which include chucks. A 2014 commercial for American Standard shows a kid talking about the new Champion toilet. He wears grey chucks while explaining the power of the product. A Snickers commercial aired around Halloween shows a few kids in costumes talking to the Headless Horseman who is confused on his identity until he eats a Snickers bar. The one costume that stands out is vampire as the boy wears black low chucks to complete his outfit. In some of the AT&T commercials where children are sitting at a table talking to a man in a suit some of the children have on chucks. In a commercial for National Choice Small Breed Dog Food shows a woman throwing a stick to her dog on the beach. She does this while wearing chucks. Greenies Dental Chews for dogs compares brushing dogs teeth to children’s teeth. The boy in the commercial is wearing grey chucks, as he gets overly enthused about brushing his teeth. A good example is a McDonalds commercial for their new breakfast meal. You see a guy wearing black high top chucks sitting on a bench in an urban park eating the new sandwich, and all kinds of people stopping by and commenting on it. A Toyota Tundra Double Cab ad featured a lot of people completing their everyday activities using this truck, and showed a shot of someone wearing brand new low cut black chucks running around. An AT&T Broadband commercial for digital cable service showed a guy wearing black chucks watching surfing through various premium channels on his TV as more and more people join the audience. A beer commercial for Coors Light showed two guys watching a sports show on TV. When the guy on the right wearing black chucks asked for a cold one, an avalanche of ice falls on him, but in the final scene, he is in an igloo with a young lady. A Verizon Wireless spot showed a guy wearing black low cuts with his feet up on a coffee table right next to a pizza. The distinctive imprint on his soles was clearly shown. A Levi’s commercial shows a guy riding a mechanical bull in a bar wearing black high tops. Carrot Top wears black high tops with red shoe laces in the “1-800-CALL-ATT” basketball commercial. Another set of commercials on ESPN showed a guy wearing black high top chucks trying to get ready for the basketball season, while hawking their shows. A Honda car commercial showed a young teenager wearing bright blue high tops in the back seat of an Accord between two girls. As he tries to get close to one of them, he is pushed away because there is so much room. A commercial for Stouffer’s pizza showed a teenager crossing his legs. The shot was from the bottom of his shoes toward his face eating the pizza. Then it hits you — he is wearing red high top chucks. An August, 2001 ad in TV Guide showed a family with their feet up getting ready to watch the 3rd Annual Family Television Awards. The feet on the left, which you would assume to be the son based on what everyone else has on, is wearing a pair of black high tops. 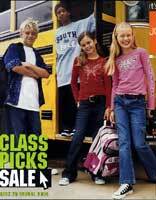 And in back to school advertising, after a long absence from department store ads, black high top chucks are shown on both male and female models in ads for Macy’s Department Stores. This is cool to see again, because for years Macy’s ads have had great chucks shots in them. Tell The ChucksConnection about the latest commercials shown in your area that have chucks in them. You can do so by emailing us at mail@chucksconnection.com. In the past we’ve reported seeing chucks at the opera, and of course in hundreds of films and television shows, so it was inevitable that they would be again appearing on Broadway. Two shows in recent years have featured cast members wearing chucks. 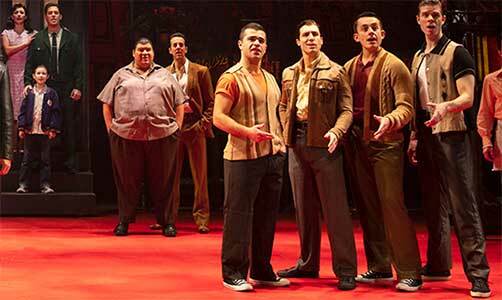 The most recent show is A Bronx Tale, based on the 1993 film by the same name and described on their website as a combination of Jersey Boys and West Side Story. 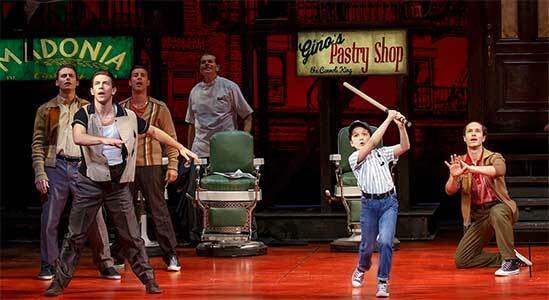 The show is a coming-of-age story about a young Italian boy growing up in the heart of Little Italy in The Bronx borough of New York City in the 1960’s. Co-directed by Robert de Niro (who starred in the original film) and four-time Tony Award winner Jerry Zaks, the show features several characters wearing chucks in the show. Several cast members besides young Frankie Leone wear black chucks in the film. Scene from A Bronx Tale. Another show that chucks appear in is called Moving Out and has received favorable press, including a rave review from Time magazine which describes Moving Out as “the #1 show of the year.” Moving Out is a result of the collaboration of choreographer/director Twyla Tharp and song writer Billy Joel. The story is set in the sixties in Long Island, New York and revolves a group of young people whose lives and romantic entanglements are severely affected after the men are called up to fight in the Vietnam war. Many of the male cast members of Moving Out appear in black, red, or white chucks. Chucks are officially back (again) and more popular than ever among teenagers. According to articles put in the media about back to school fashions, chucks are an important part of the so-called retro look, a return to the styles of the 70’s. It seems every generation has a way of connecting with chucks. In the November, 2001 issue of the Smithsonian Magazine, the official publication of America’s Smithsonian Museum in Washington, D.C., Ed Liebowitz has written an article about the Chuck Taylor shoe and its place in American history. The article is placed in the “Legacies — Collecting America’s History” section, and mentions the pair of stars and bars that Converse donated to the Smithsonian National Museum of American History in 1992 on the 75th anniversary of the start of chucks manufacture. To read the article in the Smithsonian Magazine click here. Fashion news reports out of Paris are stating that the classic Converse Chuck Taylor low cut sneaker is now the new “in” casual shoe, replacing suede Pumas as the “le basket” of choice. The trend is partially due to a resurgence of the retro look of the 1980’s, and Parisians like to wear them in a variety of colors and prints — the more outrageous, the better. Designer Marc Jacobs, who wore a bright pink pair during the March collections, helped ignite this All Star comeback — he even featured a high-heeled version in his new Marc collection. Since that first sighting, Chuck Taylors have been steadily marching off the shelves at Colette, Paris’ hippest boutique. Sometimes the clean looks of a brand new pair of white canvas Chuck Taylor high tops inspire artwork. That’s what we see here in this photo. The artist used twenty different colors of oil to complete the artwork. Then he said that he wore them around town. Maybe they should be placed in a museum of chucks. On the other end, another correspondent was lamenting the unavailability of chucks, and so decided to fashion a Chuck Taylor high top out of duct tape. Easy to put on, but hard to take off. Another correspondent was Laurie Lyden, an artist who specializes in drawing on chucks. She makes incredibly detailed and customized pairs and sent some photos of her work. Click on the link to see a complete article with photos of her custom chucks. You know this young lady enjoyed dancing at her prom. While it is no longer totally uncommon to see people wearing their chucks at formal occasions like weddings (see Here Come The Chucks! and A Taylor-Made Relationship) and proms in real life (see prom photo) and in movies(Eddie Kaye Thomas in American Pie and Brendan Frasier in Encino Man), it is always interesting to see some new twists on this theme. Recently a story about this spring’s prom season in the San Jose Mercury News showed a photo of Maritza Garcia, a 17-year-old junior, who chose teal blue low cut chucks and metallic blue anklets to wear with her dress. “I don’t like high heels,” she said. Recently The ChucksConnection heard from a comedian about the popularity of chucks among his fellow comedians. Speaking of celebrities, have you heard about Jesse Ventura’s dad? His kids and their friends called him “Sneakers” because he always wore black sneakers, chucks. In the “made for TV”, unauthorized biography about Jesse’s life this was mentioned. After his father died he inherited his Dad’s sneakers. He was wearing them when he was inaugurated as governor of Minnesota. This is the car that Converse Corporation executives should be driving. . . . to deliver chucks around the country! One reader of this website sent in a picture of a new type of Volkswagen that he thought would help the Converse Company with their advertising problems. Since you don’t see chucks advertised in magazines or featured in store ads anymore, maybe they could be promoted while cruising around town. If nothing else it would show a new approach to getting the message out and around. Have you dialed 1-800-CHUCKS today? Check out this Chuck Taylor sneaker phone! Wouldn’t you like one in your home or office? Maybe it is time to revive the old sneaker phone idea, and use that to market chucks. After all, chucks are available in many cool colors and you could knot the laces so the phone would hang anywhere you would like to mount it. Best of all, chucks don’t emit any hazardous radiation! Think of the constant advertising that you hear from various telephone companies. Wouldn’t it be great if they would help promote chucks by marketing chucks sneaker phones? Chuck Taylors have been used in television commercials over the years and sometimes are used to describe people who are “different”. Red high tops were featured in one of the Dodge “Different” commercials. As the commercial began, you heard a voice talking at a company meeting while the camera pans along the floor showing a series of polished black dress shoes and suit pants. Finally the camera focuses on a brand new pair of red Chuck Taylor high tops and blue jeans as the voice says, “And now we will hear from our chairman. . . .” Then you see a graphic: Dodge, Different. Another syndicated commercial was for E-trade, an on-line stock brokerage service. The company showed a series of spots featuring a very generation Y character who loves to trade on-line. One spot shows him interacting with his boss encouraging him not to be a “chicken” about it, and another spot shows him at his girl friend’s house emerging from the swimming pool (her dad is a wealthy stock broker) wearing red low cuts. A commercial that has appeared regularly on television for many years is a Wrangler jeans commercial that shows a teenager wearing blue or black high top chucks playing football and diving into dirt to catch the ball. The announcer says that the jeans are available in his two favorite colors, black and blue. Home Depot has been running a spot about power tools that features two guys talking about the tools, and then the camera pans down to the floor and you see that one guy is wearing black high tops. Other regionally shown commercials have included several ads for the Longs drug store chain on the west coast, featuring a guy wearing black Chuck high tops. In the spots you see him doing different things. In one you see him under a car with a friend, chucks sticking out, and in others he is walking around doing various chores or errands. The point being that Longs has all kinds of products for your everyday needs. The persona of the guy seems to be Mr. Joe Average homeowner. The last (or one of the last) chucks commercial advertising the actual product was shown in the early nineties and used the “different kind of person wears chucks” theme. It began by slowly showing a black high top being laced up. The words “Ski without skis” are typed on the screen and then you see a guy water skiing and doing stunts with his black chucks on. The music goes wild as it climaxes with the guy losing control. Next you see the words “I can’t swim” and followed by the camera cutting to the wet pair of chucks sitting on a pier. Quite odd for a sneaker commercial, but Converse had this foolish idea that chucks couldn’t be marketed to the mainstream any more. To sum up, it seems that some people are considered different because they wear chucks, but in other situations they are a normal casual wear shoe. People who have sent in their opinions about the marketing of the Chuck Taylor often state that the company needs to have a campaign to emphasize the second idea. Jamara Kellerman (Mother) and Noel Carey (Fred) appear in The Tale of the Nutcracker. When you think of Converse Chuck Taylor All Stars, you usually think of leisure activities, sports, and a casual life style. Seldom do you think of them in the context of formal occasions, although once in a while you do see people wear them with formal wear for a wedding or anniversary when there is some personal meaning for the participants. 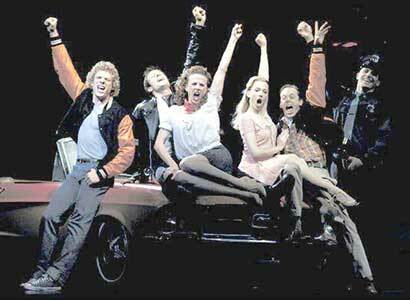 But in December, 1999, Chuck Taylors make it into the world of grand opera. Opera San Jose presented the world premiere of an opera by Craig Bohmler and Daniel Helfgot entitled The Tale of the Nutcracker where one of the characters Fred, played by Noel Carey, appears on stage wearing red high top chucks. The opera is a contemporary look at the family of the toy maker who crafts the nutcracker toy used in the famous Tchaikovsky ballet and presents a coming of age theme for young Marie (the girl who is given the nutcracker for a present in the original ballet) as she must choose between the dream environment of the Nutcracker or the reality of growing up. In her reality environment, Marie interacts and fights with her younger brother, the chucks-wearing Fred. A new opera, It’s a Wonderful Life, based on the film of the same name, featured one of the young cast members wearing chucks. It’s always cool to see a pair of chucks being worn in a formal setting. Recently one of our correspondents told us about a mid-nineties horror film called Ice Cream Man, a typical, low budget effort in this style but unusual because it also seemed to have an underlying Converse Chuck Taylor theme. Audience response seemed to fall into two categories: those who thought it was camp, cheesy fun, and those who just thought it was a bad film, with few redeeming features. Some of the people who posted comments on the web also noted that there was a Converse theme to the film. What they were referring to was the extraordinary number of characters wearing various colors of Chuck Taylor high tops in the film, and a lot of close ups in the cinematography. Zachary Benjamin played Roger Smith in the 1995 horror film Ice Cream Man. “During the filming of Ice Cream Man, all actors were directed to wear Converse shoes by the producers and the director, Norman Apstein. When we inquired about this, we were told that Converse was sponsoring the movie. This informal contact was the only information I had concerning the sponsorship. I don’t know how much money was provided by Converse or to what extent they sponsored the movie. You may be able to get better information from Doublesteen Productions in Los Angeles. “As far as the colors chosen, the producers were trying to create a kind of surreal tone with the movie, so they tried to chose bright colors that would stand out. The costume scheme for the movie was supposed to be kind of ultra-modern, although I don’t think they really accomplished that as effectively as they wanted to. There were no specific instructions to show off the shoes, although there were scenes where the cinematography was clearly focusing on them. For instance, during the scenes where the characters were sitting on the park swings, the camera did tend to focus indirectly on the shoes. It was kind of a neat effect, actually. “I believe the intent of the film’s producers was to make a campy, modern psychological horror film. I think the purpose was to kind of shock people while, at the same time, making them think about the outcome and the motives behind the Ice Cream Man’s actions. I think the opening scene was supposed to be the first signs to the of the Ice Cream Man’s insanity. The fact that he is toying with a little kid’s emotions is supposed to start people thinking about what his problem is and why he has this emotional defect. Unfortunately, due to the low budget of the film, I think it fell short of its goal of thrilling audiences and creating a psychological puzzle. I think it will end up as a cult favorite, kind of like Rocky Horror Picture Show, if not quite that successful. While it’s great to see Chuck Taylors placed in a film, you would have to wonder what Converse’s marketing strategy was for supporting a project like Ice Cream Man. The film wasn’t a enough of a big budget project (only $2,000,000) to penetrate the main stream market, the content and production values weren’t going to earn it good reviews, and its R rating theoretically eliminates a lot of the youth market that you would presume to be the focus group for the product placement. The ChucksConnection has listed and reviewed over 860 films where a lead actor wears Chuck Taylors, and many of these films are outstanding examples of their genre. The Converse Company might get better results for its product placement dollar by getting some of these actors to endorse their product or just sending them free pairs of chucks to wear. Have you recently seen Chuck Taylors in an unusual place or situation? If you have an article or other information about Chuck Taylors to submit to this website, please contact us at mail@chucksconnection.com. Please Note: Similar reports may be combined and your content may be edited. Submission is no guarantee of posting on this page. Return to Page Index.